The suggested test is aimed at the development of a quick test for the potential ability of an engineer to solving complicated professional problems. The known tests for creative abilities give us only an idea of “creativity in general”, but not an estimate of a specific “susceptibility” to solving engineering problems; the difference was described by Altshuller . Our test is based on the assumption that solving a complicated engineering problem requires the ability of a solver to identify the relationships of “essential similarity in different” and “essential difference in similar”. 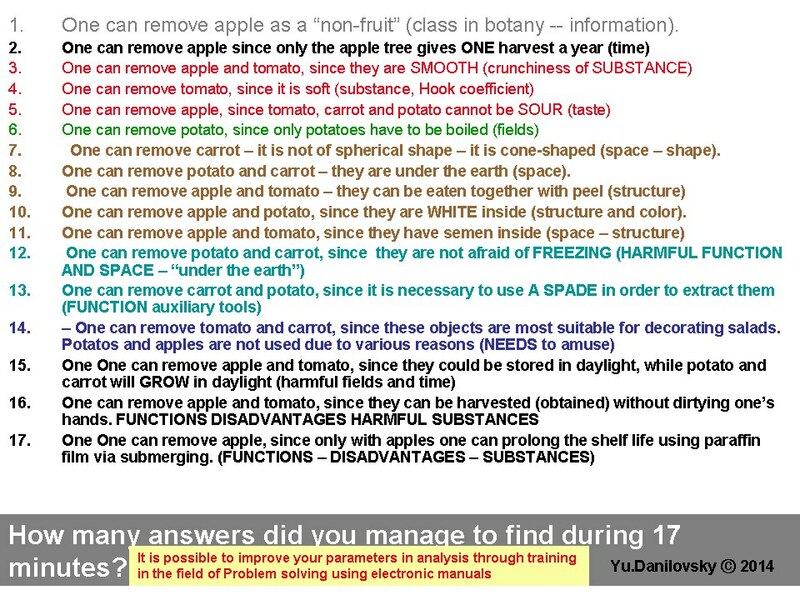 So, we ask a testee “to suggest multiple (as many as possible) way to remove one or two objects of total four by some reason and explain this reason”. When analyzing the test results, we found that our best students (by the results of final testing) preferred to ground their suggestions by essential reasons (e.g. 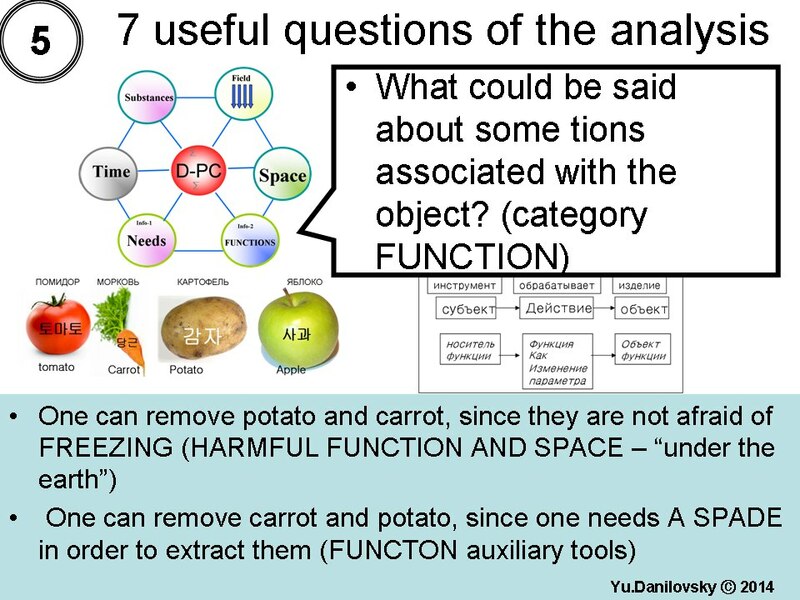 “remove the carrot: it only grows single in a plant), whereas others often used formal, external grounds (e.g. 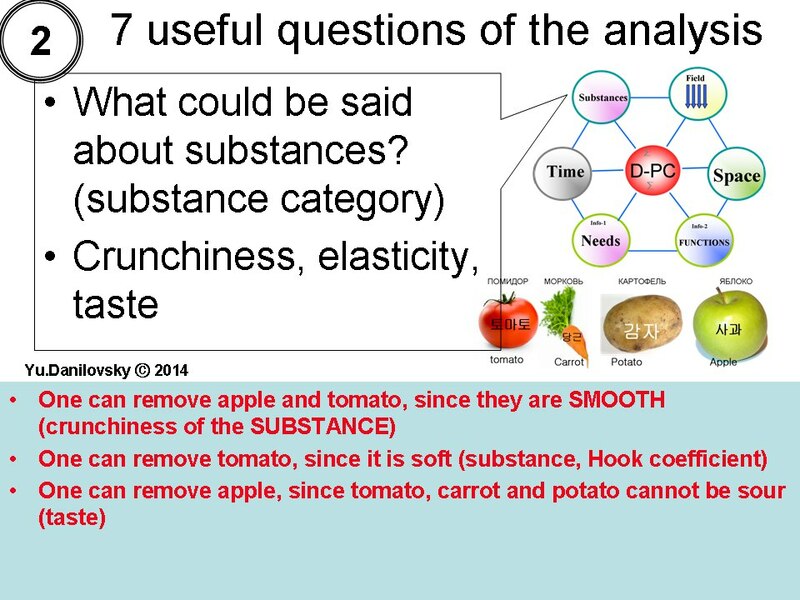 “remove the carrot: it only ends with a consonant”). This and other differences between the tests of “good” and “ordinary” students allow us to select potentially best students, which improves the efficiency of our classes. • Creativity (from Engl. create) — creative сability of the human, characterized by readiness for accepting and creating fundamentally new ideas, deviating from traditional or accepted patterns of thinking and included with the structure of talent as an independent factor as well as capacity to solve problems, occurring inside static systems. According to the American psychologist Abraham Maslow — this is creative orientation, which is inherently characteristic of everybody, however, which is lost by the majority under the action of traditional system of upbringing, education and social practice. • Creative capacities are the capacities of the human to take creative decisions, to accept and to generate essentially new ideas. 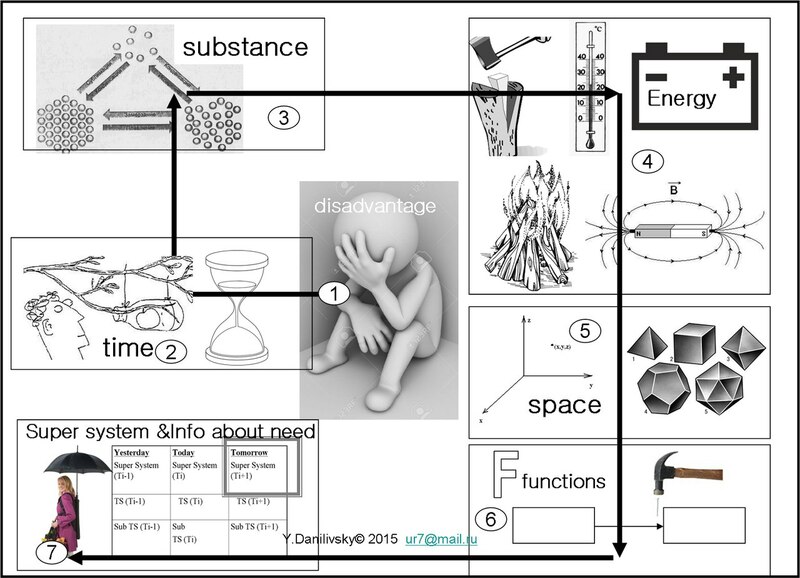 • In everyday life creative capacities manifest themselves as smart performance — ability to reach the goal, find an outcome from a situation which seems to be a dead end, using ambience, objects and circumstances in an unusual way. 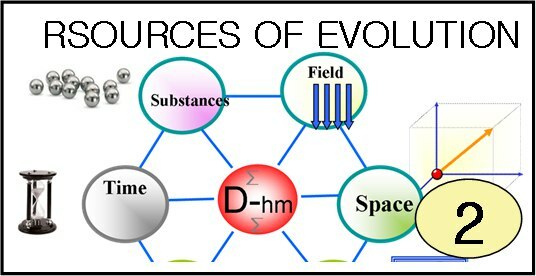 5) resources of space in the form of variability of form and types of symmetry, types of motion and simply the occurrence of empty cavities. 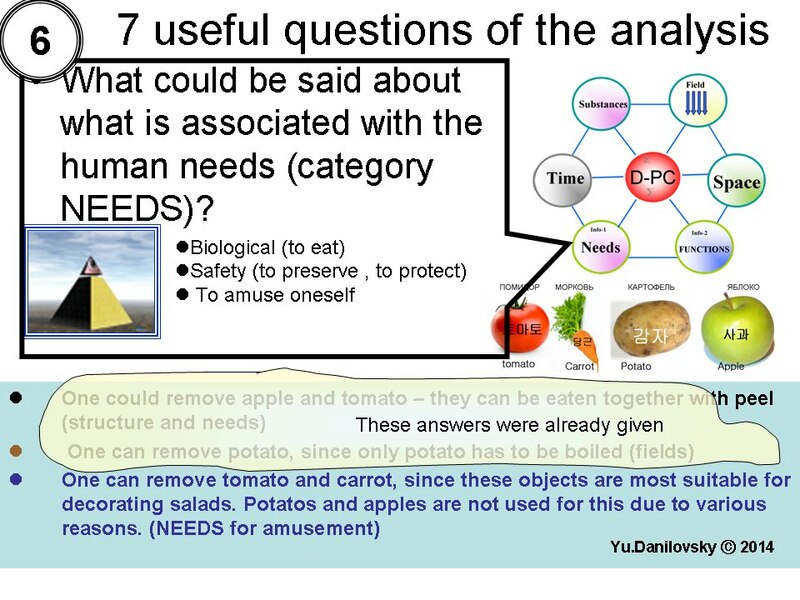 7) resources of what exists in the environment in the form of material objects as well as knowledge of stereotypes of human behavior, circumstances of current political and economic situation: crises, enthusiasm, patriotism, etc. this categories we can put in Fig. 1. The category “creative thinking” can be considered from many viewpoints and studied in many branches of sciences and humanities, such as philosophy, psychology, engineering, art, etc., depending on what we would like to understand and/or how to use it in practice. 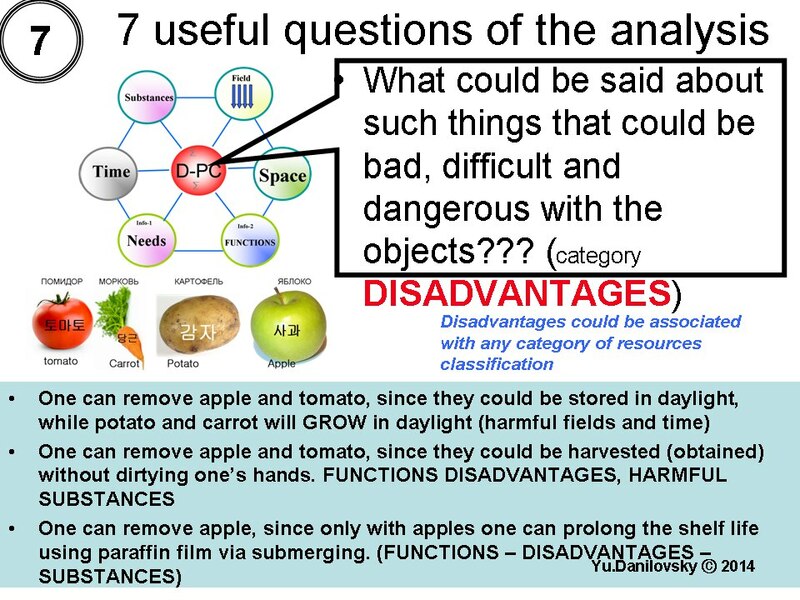 This presentation considers an “empirical”, practical respect of problem: how to assess the potential ability of an engineer to solving complicated professional problems without direct tests in solving real practical problems? We do not say about a thorough, statistically reliable test, but try to find some “approximate”, “fuzzy” solution for a problem that we face in our everyday practice: how to find few people who would (with some probability) be the most successful in studying TRIZ among “a crowd” of engineers who could try this? Currently we have no practical tools for that and, in fact, make a selection just by occasion. The known tests for creative abilities, e.g. tests for intellect (IQ, e.g. ) or tests for “creativity”, like , give us, in the best case, only an idea of “creativity in general”, but not an estimate of a specific “susceptibility” to solving engineering problems. The difference was well described by Genrich Altshuller 60 years ago ; however, nobody seems to suggest a practical test for the latter thing. In this paper, we suggest a series of very simple tests that appeared helpful in our express input diagnostics. Our basic idea is based on the well-known statement that we prove in our everyday engineering practice: solving any (without exceptions) complicated engineering problem requires the ability of a solver to identify the relationships of two kinds: essential similarity of something that “look different” and essential difference in something that look “similar”. 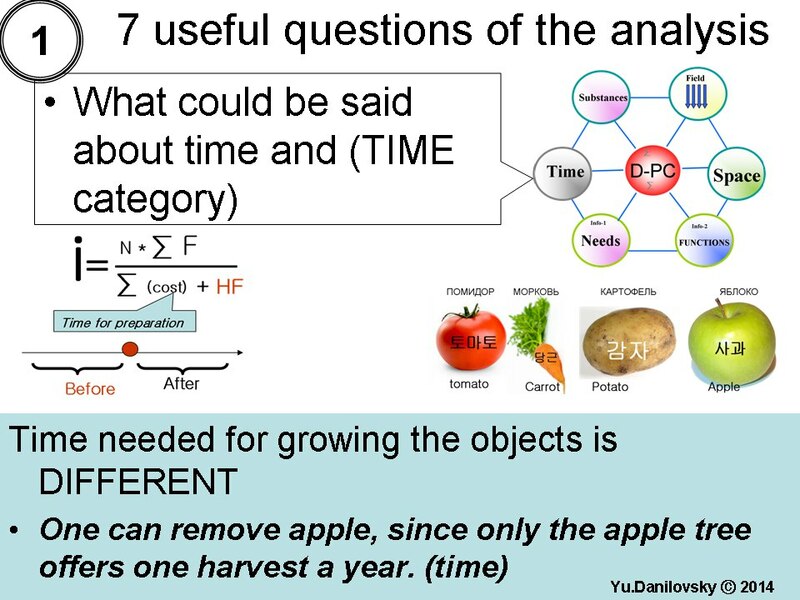 So, we suggest a simple visual test where a testee has “to suggest multiple (as many as possible) way to remove one or two objects of total four by some reason and explain this reason”. One variant of this test is specified in Fig. 2. When analyzing the test results, we found that different people use different bases for making their conclusions: some of them mostly use formal, external bases (e.g. 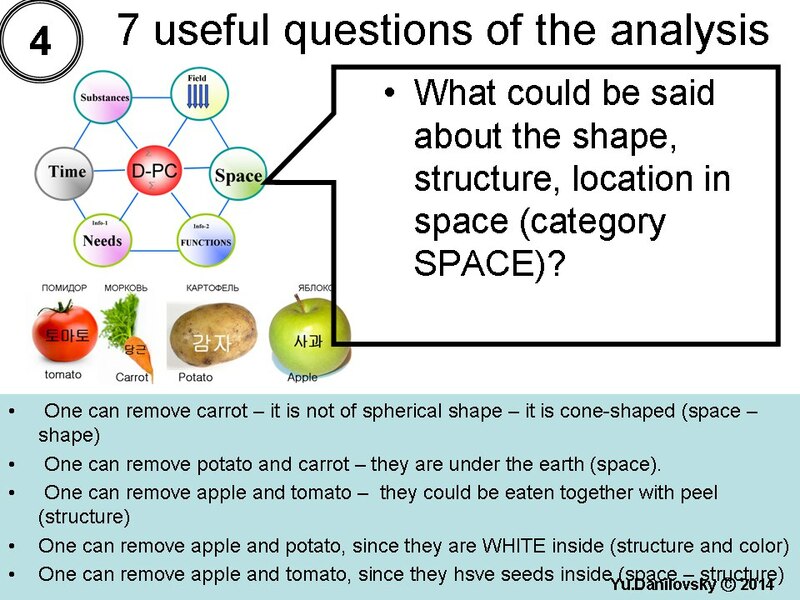 “remove the carrot: it only ends with a consonant”), whereas others try to find deeper, essential grounds (e.g. “remove the carrot: it only grows single in a plant). The latter category of people was found, in most cases, having better “affinity” to learning TRIZ. As a result, we became able to quickly find the people who, most probably, would be more successful in our classes. Now we have only small statistics (35 people being tested), but the results look promising. In the future, we are going to analyze different respects of the students’ answers: speed (number of given answers per minute), originality (fraction of rare or unique answers), etc., which, we hope, would allow us to improve the quality of our test. 1. Eysenck, Hans (1998). Intelligence: A New Look. New Brunswick (NJ): Transaction Publishers. ISBN 978-0-7658-0707-6. 2. Forster, E. A., & Dunbar, K. N. (2009). 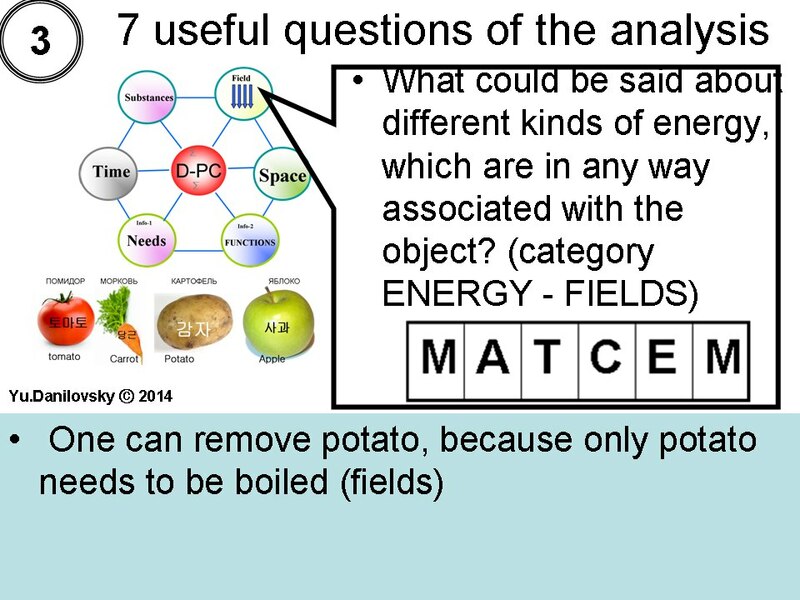 Creativity evaluation through latent semantic analysis. In Proceedings of the 31st Annual meeting of the Cognitive Science Society (pp. 602–607). 3. Altshuller G.S., Shapiro R.B. (1956). On the psychology of the inventive creativity: Problems of Psychology, No. 6, p. 37-49 (in Russian). 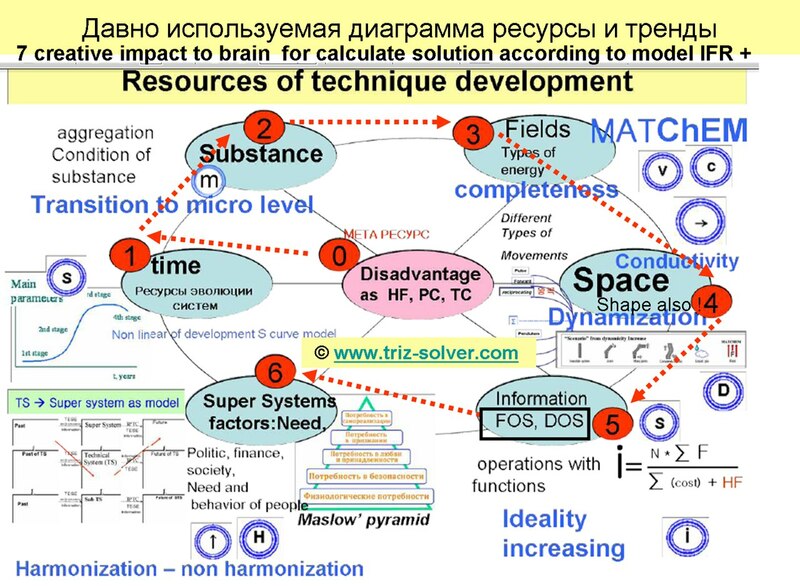 5, Y.Danilovsky, S Ikovenko, R.Menon TRIZ SUMMIT SPb 2015, " Altshullers matrix as a training device and means of measuring in the development of dialectic thinking." Специальные кроссворды как основа для компьютерных игр , направленных на тестирование и развитие творческих способностей к изобретательской деятельности. Разработанные простейшие компьютерные игры в форме кроссвордов, отличающиеся тем, что : 1) компьютер измеряет скорость заполнения ячеек кроссворда 2) вопросы для заполнения ячеек составлены в большинстве случаев в форме модели Технического Противоречия (ТП) для угадывания слова (пример ТП :" Если параметр А возрастает, то это хорошо, ОДНАКО это приводит к тому, что ухудшается параметр Б и это плохо ) 3) все слова в ячейках кроссвордов являются техническими параметрами и описывают исключительно физические процессы, которые происходят в технических системах при их функционировании. творчества. 4) совмещение развлечения с тренировкой креативного мышления одинаково возможна в использовании как для контингента школьников и студентов, так и для сложившихся инженеров - изобретателей. 5) игры в режиме тестирования могут быть фильтром для отбора слушателей в группы "специалисты по обходу патентов circumventing of patents и cost reduction" в случае для взрослых и в группы " практикующий изобретатель" для школьников и студентов.